You’re interviewing potential candidates for an open position on your team. Those set to meet with you to discuss the opportunity are most likely a little nervous - but if you think about it, things are a little nerve-wracking on your side of the table too. The pressure is on to select the “perfect” candidate by weeding through the underqualified, the overqualified, and the average. The only way to do this successfully in the short amount of time allotted is to ask the right questions. These questions are open ended, and they leave room for the person in front of you think and to take the lead (or not). Bringing out the best and the worst in your interviewees with the right questions is imperative to gaining insight into their demeanor, skill set and work ethic. Below are Judge’s Top 7 questions you must make sure you’re asking before extending an offer. This answer will tell you if the candidate’s mindset and goals are in-line with your company and the position. This also allows the person in front of you to open up about why they were searching for a new opportunity in the first place. You want someone who isn’t running from their last role but aiming to rise above it. If someone is truly excited about this opportunity, their answer to this question will reflect that. If the first few reasons they list have to do with pay, benefits, or commute, they aren’t the right one for this role. You want someone enthusiastic and dedicated to their work. Their answer will also allow you to see how well they understand the role and if they would actually enjoy it day to day. This question will show a lot about someone’s personality, work style, and ideals. Most importantly, it will help you measure this candidate's potential to excel in this role and the company. Happy and motivated employees mean less turnover and more success. Someone who prefers a laid back and collaborative work environment might not fare well with a hiring manger who is rigid and tends to micromanage. An answer to this question will allow you to see if your company’s work culture is a match for this candidate as well. What was your biggest challenge in your current role and how did you overcome it? It may not be the best sign if a candidate has a hard time answering this question. Their answer will give you a good glimpse into their performance and their work ethic. It will also help you better decide if they would fit this role in particular. This question helps you tune into what this candidate finds motivating & rewarding and if they are a problem solver. If they open up about what they would do differently or what they learned, you’ve found a winner. If hired, what is the first thing you would want to tackle in this position? This is a make or break question. Is this person smart? Do they understand this role? Do they understand the work? Do they have as much experience as they say they do? Their answer will spill the beans. They may also give you an answer that blows you away and has you see things from a different and refreshing perspective. What is something you want to improve upon professionally? Of course, you can’t expect the person to give you a completely raw answer that sheds a negative light on themselves, but an intelligent response that is honest is best. Bonus points if they explain how they plan to improve or develop a professional skill. Having things in common with the people you work with is great and as a hiring manager, you want to have an idea of the kind of person you will be working with. You can tell if a person is level headed and motivated by the things they choose to do in their spare time, so pay attention. A good work-life balance is also very important to someone’s happiness. Will their personal life match up well to the demands and schedule of this role? Obtaining answers to these questions give you a well-rounded look inside the mind of the person you are considering making part of the team. 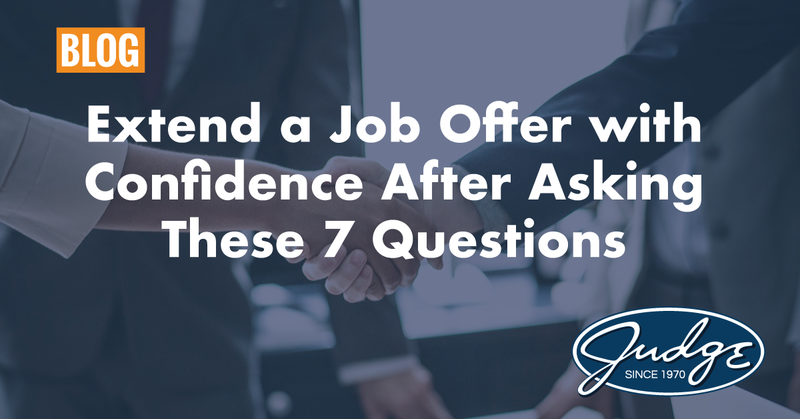 Extending an offer with confidence will make the hiring process much more enjoyable and smoother for everyone involved. Don’t forget to do your homework and ask the candidate’s future coworkers the qualities and skills they feel are essential to being successful in this role. Getting everyone’s perspective also will help you zone in on the best one for the job. Good luck!